Serene and pristine, Turks and Caicos is a once in a lifetime destination that is simply unforgettable. Humbly home to a breathtaking coastline, beautiful beaches and some of the most incredible hotels in the Caribbean, Turks and Caicos is truly a hidden gem. There are dozens of hotels in Turks and Caicos, but admittedly many are bunched together along the expanse of sand that is Providenciales, known as Provo for short. Despite this cluster of hotels in the one spot, there is more than enough room to go around. With thanks to considerate planning when it came to tourism growth, Turks and Caicos have created a destination where every hotel offers a retreat-like environment and a real sense of privacy. From exclusive oceanfront boutique hotels to elaborate family villas, Turks and Caicos has an accommodation option to suit every travel style. A popular destination with the great and the good, the average holidaymaker has a high chance of brushing shoulders with the stars in Turks and Caicos. The appeal of Turks and Caicos is the sheer lack of things to do, other than to relax. Travelers do not head to this remote archipelago to rave the night away, to shop till they drop, nor to explore a wealth of historical gems; travelers head to Turks and Caicos to do absolutely nothing at all. It is the perfect place to do just that. Let’s explore where to stay in Turks and Caicos. Grace Bay can be found in Provo and is the first of the two main hotel hubs in Turks and Caicos. Although a hotel hub, there are only really a handful of hotels in the neighborhood, compared to other Caribbean resort neighborhoods. Grace Bay is elegant and stylish. There are a number of high-end hotels and a couple more affordable options for good measure. When it comes to things to do in Grace Bay, relaxing is the aim of the game. With such pristine beaches to enjoy, travelers seldom move further from their room than to the sun lounger and back again. Turks and Caicos is famous for its 14-mine barrier reef and there are companies who provide diving day trips for those who are PADI-certified. For travelers opting for a self-catering villa, know that there are a couple of big supermarkets in the Grace Bay town. There are dozens of bars, bistros, and cafes too, for those indulgent – and a little lazy – holiday moments. Bianca Sands on Grace Bay – Bianca Sands on Grace Bay is a superb hotel in Turks and Caicos and is not to be missed. The rooms and suites have been designed with care. All offer plenty of space to spread out and feel at home. The resort is quiet and peaceful and the staff are attentive and respectful. Seven Stars Resort & Spa – Seven Stars Resort & Spa is one of the more accessible hotels in Grace Bay and is a popular choice for couples. There is an extravagant American-style breakfast included in the room rate, in addition to free WiFi and parking. Many suites have a garden view and either a balcony or a patio. Villa del Mar – Villa del Mar is an ideal hotel in Grace Bay for families. The villas have self-catering facilities but breakfast is included in the room rate. There is an outdoor swimming pool, in addition to a tropical garden and hot tub. Guests have access to free WiFi throughout their stay. The Bight Settlement is the second of the two hotel-hub neighborhoods in Turks and Caicos. In all honesty, without the use of a map, it is hard to differentiate the two. Both The Bight Settlement and Grace Bay are home to gorgeous beaches, a handful of brilliant bistros and, of course, idyllic resorts too. The Bight Settlement is home to The Bight Park, which is not to be missed on a Thursday evening. The whole neighborhood and almost all the hotel guests of the area congregate at Bight Park for live music and a traditional fish fry. For travelers seeking something a little more authentic from their time in Turks and Caicos, the Thursday night fish fry is a must-do. The Bight Settlement is just a stone’s throw away from the Providenciales International Airport. Thankfully, the incoming planes do not disturb the blissful peace on the beaches. It is possible, however, to get from the airport to the beach in eight minutes – ideal indeed. La Vista Azul Resort – La Vista Azul Resort is an affordable hotel in The Bight Settlement. There are studio apartments available, many of which offer incredible views of the ocean. The resort is just a two-minute walk from the beach. There are not one, but two rooftop swimming pools and a well-positioned sun terrace. Windsong Resort – Windsong Resort is a fabulous hotel in The Bight Settlement. The resort owns 133 meters of private beach that guests are welcome to enjoy as they please. There is a spa complex in-house that offers everything from facials to massage and more. There is an in-house cafe too, called JoJo’s Cafe. Reef Residences – Reef Residences is an ideal option in The Bight Settlement for travelers who want a little independence and room to explore. There is a bar on site but guests are free to dine in town and explore the culinary delights that Turks and Caicos has to offer. There are family rooms available. On the easterly side of Grand Turks Island is Cockburn Town, the capital of Turks and Caicos. The island is so small that the town itself takes up almost all of the landmass. Despite its small size – it is possible to drive around the island in less and an hour – Grand Turks Island has an international airport and plenty of tourist attractions. Cockburn Town is perhaps the most historically interesting place to visit in Turks and Caicos and provides travelers with a brilliant introduction to the island. 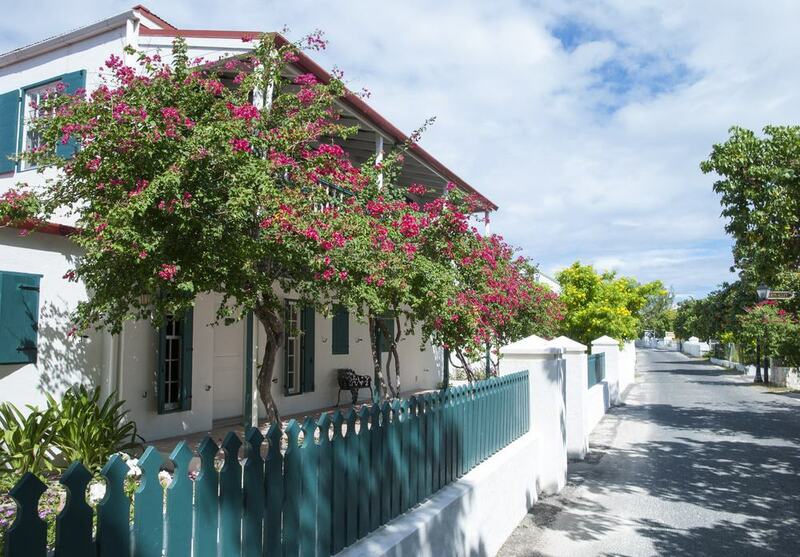 Much of the architecture dates back to the colonial era and there are a number of streets that have a more Bermudan feel too. Aside from relaxing on the beach, strolling in the sand and paddling in the ocean, there is a lot to keep travelers busy in Cockburn Town on Grand Turk Island. There are many dive shops dotted along the beachfront offering snorkeling day trips in addition to more advanced scuba diving trips out to the reefs. Bohio Dive Resort – Bohio Dive Resort is the perfect place to stay in Turks and Caicos for travelers keen on maximizing their dive time during their trip. The resort is right on the beachfront and there is a dive shop within the complex. There is a good breakfast included in the room rate – perfect for a day of diving. Turks Head Inne – Turks Head Inne is a great hotel in Cockburn Town. There are executive and economy suites available, making Turks Head Inne an accessible and affordable option for all kinds of travelers. Many rooms offer a garden view and premium rate rooms offer ocean views that are worth every penny. Osprey Beach Hotel – Osprey Beach Hotel is a luxury hotel on Duke Street. Overlooking the ocean and offering an outdoor swimming pool and a fantastic restaurant, Osprey Beach House is a real gem. There is a sense of romance to the whole hotel and it is popular for wedding parties and honeymoon couples. Turks and Caicos is an incredible destination. There really is something for everyone. Although there are nine hotels listed above, we thought that these five shouldn’t miss out on our list of where to stay in Turks and Caicos. 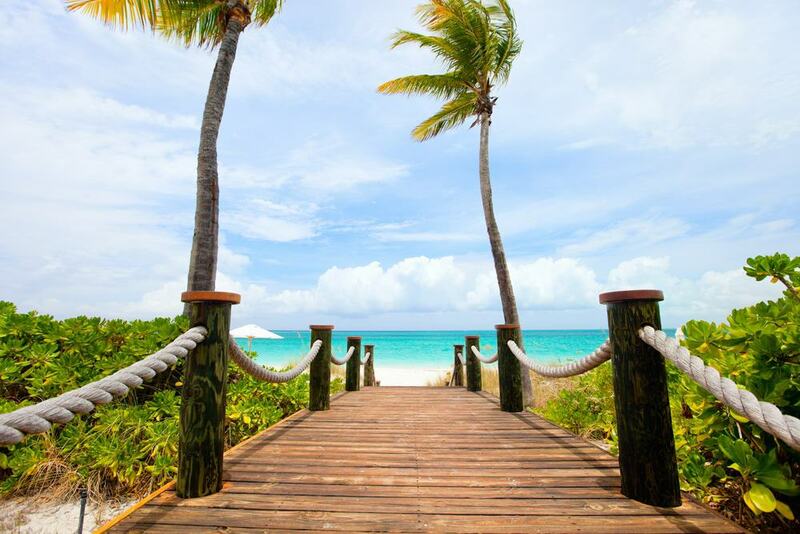 The Best Hotel for Beach Bums – Turks and Caicos Oceanside – Turks and Caicos Oceanside is the perfect hotel for beach bums who don’t intend on leaving the sand – or the sea – from sun up to sun down during their trip. The apartment offers guests complete freedom and total luxury. There is a restaurant on site but the apartment has a kitchenette too. There is a swimming pool within Turks and Caicos Oceanside but the North Atlantic Ocean is only a matter of steps away. The Best Hotel for All the Family – Villa Paradiso – For big families or groups heading to Turks and Caicos, Villa Paradiso is an ideal accommodation option. The villa can sleep up to fourteen people across seven bedrooms. Villa Paradiso is set away from the hotel hub and offers guests privacy and seclusion. There is a very well equipped kitchen within the villa and the supermarkets are only a stone’s throw away. There is a beautiful outdoor swimming pool and a spacious sun terrace too. The Best Luxury Boutique Hotel – Como Parrot Cay – the best luxury boutique hotel in turks and caicos is como parrot cay. located on little-inhabited parrot cay, como is understated luxury at its finest. the whole hotel is minimalist and elegant. guests have their own private balcony or terrace attached to their suite and the bathrooms are divine. there is a holistic spa in-house and open-air yoga classes are laid on every morning. This is in addition to Japanese baths, a hot tub, and an infinity pool. The Best Hotel for Honeymoon Couples – Sailrock Resort – Located on the island of South Caicos is the incredible Sailrock Resort. For honeymooning couples seeking a romantic retreat, this is an ideal place to stay. The suites are all generous and offer breathtaking views of the ocean. The rooms are stylish yet homely and have a subtle beach theme. There is a bar within the hotel resort and a restaurant too. Guests of Sailrock Resort have access to the hotel’s stretch of private beach. The Best Self Catering Villa – Three Cays Villa – The best self-catering villa in Turks and Caicos is Three Cays Villa. The villa overlooks the ocean and can be found on Bristol Hill Road. The villa can sleep up to eight people and each guest room is generous. There is a kitchen and large dining room space ideal for big family meals. The supermarket is within easy reach. There is free parking at Three Cays Villa and free WiFI throughout too. Turks and Caicos is a phenomenal destination with so much choice when it comes to hotels and self-catering villas. From the boutique and exclusive to the family-friendly, Turks and Caicos has something for every kind of traveler and every budget. With three great neighborhoods to choose from, travelers are bound to find the perfect place to stay in Turks and Caicos on this list.